Samsung and, one suspects, Microsoft are serious about promoting the just introduced ATIV Tab 3 — buy one and get a free copy of Office 2013. Yes, there is a full, not RT, copy of Windows 8 running on it, while Sammy’s new ATIV Q is powered by both Android Jelly Bean and Windows 8 — welcome to Samsung London Premier 2013! 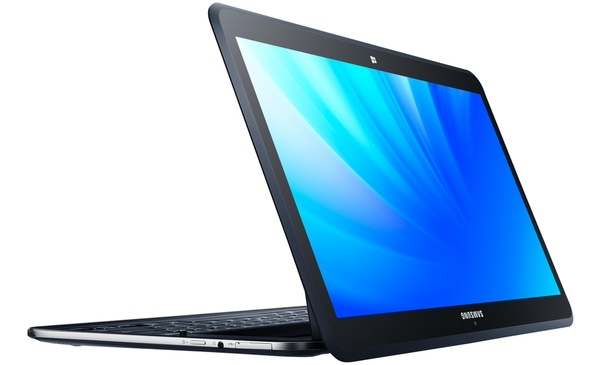 The Samsung ATIV Q is a 13.3-inch convertible device that runs both Windows 8 and Android Jelly Bean. Weighing just 2.84 pounds and measuring 13.9mm thin, or a bit more than a 0.5-inches thick, the ATIV Q packs an i5 processor, a 275ppi display and 128GB of flash storage while promising nine hours of battery life. Whereas the hardware is beautiful, the use case for the ATIV Q is still an open question. Samsung London also witnessed the introduction of the ATIV Tab 3, a 10.1-inch slab weighing just 1.21 pounds and measuring an anorexic 8.2mm thin. It runs only Windows 8 and comes with a complimentary copy of Office 2013. Think Windows RT isn’t dead? It may take some time for the official death certificate to be posted, the Windows 8-only ATIV Tab 3 and similar OEM tabs underscore just how badly Windows RT is doing in the market. That said, whether or not Microsoft’s mobile strategy is right, they’re working hard to make it work. And, once upon a time, Android was targeted at the stand-alone camera market. Samsung remembers those days and has released a prosumerish snap taker to make the point. The Galaxy NX Camera runs Android 4.2, sports a 4.8-inch touchscreen and packs a 20 megapixel sensor inside. Nevertheless, the Galaxy NX is described a “compact” camera and is compatible with Sammy’s NX line of interchangeable lenses. Samsung hasn’t announced ATIV Q, ATIV Tab 3 or Galaxy NX pricing or availability. However, at least one inside source says the ATIV Tab 3 will be priced between $500 and $600. Liking what Samsung is doing or is it just more model/product confusion?